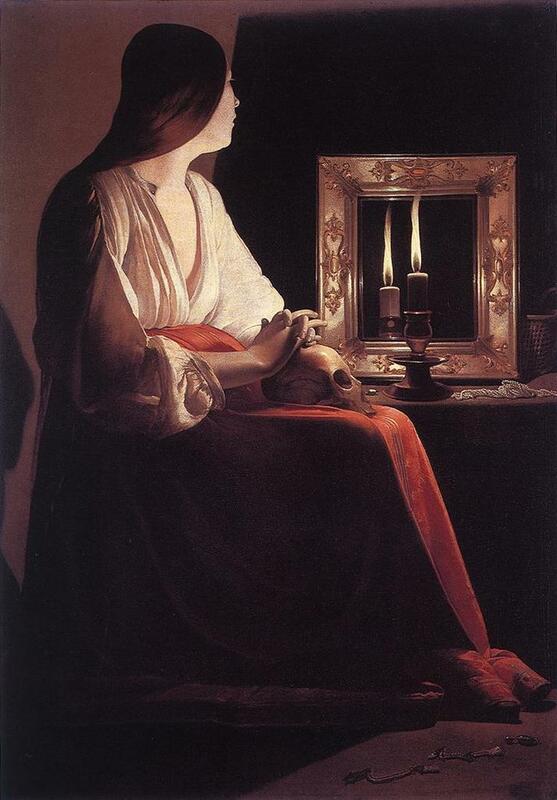 I can never think about Mary Magdalene without thinking about these images by Georges La Tour. I love La Tour’s work because of his use of light and shadow. Word is, he was a rather unpleasant character–as artists can be–but his religious paintings are awe inspiring. (I do tend to confuse him in my head with Caravaggio–they both fit in the light & shadow category.) Anyway, enough about La Tour. His two works of Mary Magdalene that I’ve included here come with some of the standard features that relate to her iconography. Not much is known about St Mary and Church Tradition–never one to leave an amusing story uncreated–filled in with a vengeance. All four gospels tell us that she was at the crucifixion and that she was a witness of the Empty Tomb–John tells us she saw more as well… Thus, she was an important part of the Jesus Movement. Luke tells us that she was one of the financial supporters along with several other women and that Jesus cast seven demons out of her. That’s where the biblical witness ends. Church Tradition picks up there, of course. She gets associated with the woman in Mark & Matthew who anoints Jesus with costly perfume and wipes his feet with her hair shortly before the Last Supper and therefore also with the woman in Luke’s (displaced) version who bathes Jesus’ feet with her tears and wipes them with her hair. One of the common features in pictures of Mary, then, is a jar of ointment as in Caravaggio’s Magdalene. Then some connect her with the woman in John 8. Sometimes she also gets to be Mary of Mary and Martha fame and the sister of Lazarus. Then there’s the whole red-headed prostitute bit; I have no idea where that came from. The text certainly doesn’t tell us. The Dan Brown crowd…we won’t even go there. 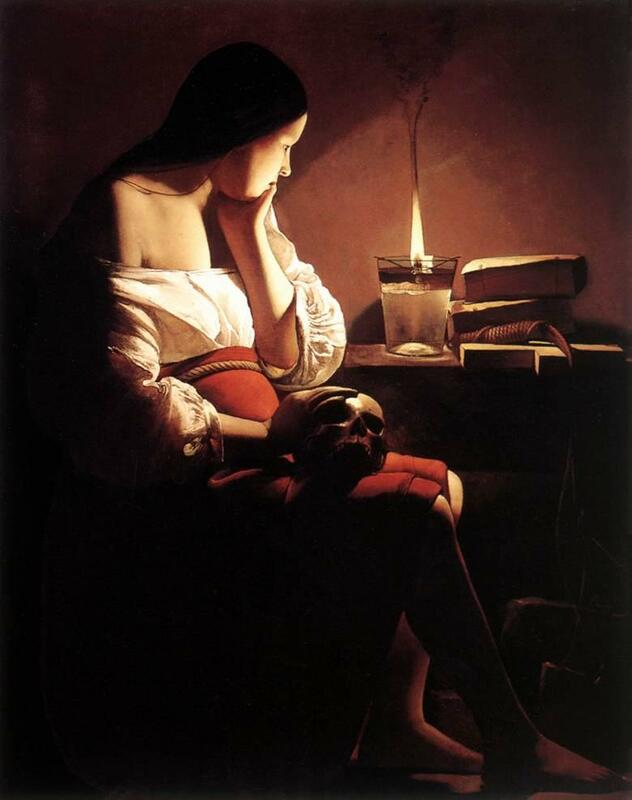 The point of all of this stuff in the Tradition–most of which is down-right slanderous–is to portray St Mary Magdalene as the archetypal penitent. She is the one who has lived a wild, dissolute, sinful life particularly involving lusts of the flesh. Her portraiture, then, represents penitence that rejects the gauds and baubles of this world in favor of eternal life, chastity, and purity. Yes, there’s a certain stream of asceticism here that can be anti-creation and that can be taken to unhealthy extremes. On the other hand, there’s also an asceticism in here that speaks to a shallow consumer culture goaded to ever-incerasing, ever-destructive acquistion through advertisements glorifying lusts of all fashions. for Sandman afficianados). Temporary pleasures versus eternal habitation… The rejection of worldly iniquity is shown by the scattered jewelry. Typically it’s on the floor showing that it has been rejected and cast away–La Tour puts some on the desk so we can see it. So on this feast of St Mary, we can celebrate not only a sister of the faith who played an integral part in the early days, who served as the apostle to the Apostles–telling them of the resurrection before they even knew–and who was evidently a close and precious companion of Our Lord but also ponder the place of penitence in the midst of a shllow gaudy world that throws up amusements and entertainments rather than wrestle with the stark realities and hard edges of life. Mary calls us away from addiction to an opiate culture and to the reality of the Light which the darkness cannot overcome. The pictures are from The Web Gallery of Art which I discovered in my internship days. My senior pastor told me I had to do PowerPoint sermons…so I did. But let’s be subversive, people–I got all of my pictures off of this site. If people have to look at something while you talk, make it the classics that have nourished Christians for centuries not freakin’ clip art. Ah…powerpoint. I used almost all icons (or should I say, ikons). I had to use ppt during a communion service, so the screen had a huge Pantocrator on it while people communed. Thank God we stopped all that silly ppt worship. I am often too attached…too mesmerized by the lights and sounds of this world…clinging to what satisfies for a moment while neglecting that which really sustains. Good food for thought…thanks. Thanks for the web gallery link as well Derek, I wasn’t aware that such a collection of images existed. What a treasure trove! I promise to use them this year as part of the Christian Ed. program at my parish. Mary of Magdala. I adore her and I’m completely convinced that she was a full disciple (from the Gospel of St. Thomas and other Gnostic sources). I believe that she established her own branch of Christianity, PBS might have something to do with that, and I am also convinced that it was persecuted into extinction as the church tried to reassert the sexual bias that was the norm of their societies. So, you see, I feel a certain rage when people refer to her as the prostitute–clearly proof to me that people do not read the Gospels themselves! Anyway, it was a very nicely written article. I didn’t see your art. Humbly, as a writer, I avoid any possible breech of copyright and that’s why I end up with the stupid clipart when I need graphics. Whoops! It must have been late when I wrote that. I meant to say that I think she is a full Apostle. Heavens! As some-one who also hopes to produce a number of books I understand your copyright/IP concerns. As far as I can tell, though, this use of these images qualifies under fair use for “personal and educational” purposes. Given the specific context and the didactic and inspirational nature of it, I would consider it educational. To me it seems that this use is just as if I quoted an author in a sermon. Certainly it’s possible that Mary had a larger role in the early church that we don’t know about but the evidence either way doesn’t allow us to say for sure. 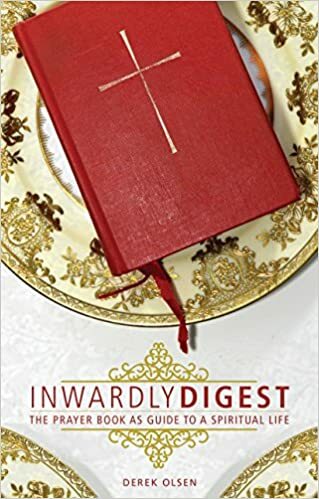 After all, the “Gospel of Mary”–which some point to for evidence on this point–is from the third or fourth century and certainly not from the hand of Mary herself. However it is a clear fact that women played a key role in the early church and that this role changed when it became a more respectable religion. The place of widows and virigins is emphasized in the early documents and even up through the fourth century but a shift does take place then. Good insights…reading this I kept thinking about vocation and via media…especially given the converations I had with my friends this morning…one went on and on about the greater value of celibacy…look at Gandhi, Jesus, Buhha, Paul…and I kept saying, it’s not about which is better, but what is the yoke that will grow you into G-d? The Western traditions surrounding Mary Magdalene do seem strangely pre-occupied with her supposed early career. However, both John Chrysostom and Ambrose include her in discussions of holy virginity. In Orthodoxy, she is generally called “the great and holy myrrh-bearer Mary Magdalene, equal of the apostles”, and she is revered as a virgin.